This delicious recipe is healthy and low fat without compromising on flavour. Each serving provides 141kcal, 20g protein, 3.5g carbohydrate (of which 3g sugars), 5g fat (of which 0.8g saturates), 0.3g fibre and 3.6g salt. Pat the fish dry with kitchen paper and evenly rub with salt, rubbing it inside the cavity as well if you are using a whole fish. Put the fish on a heatproof plate and scatter the ginger over the top. Set up a steamer or put a rack into a wok or deep pan. Fill it with 5cm/2in of water and bring to the boil over a high heat. Put the plate of fish on the rack, cover tightly and steam the fish until it is just cooked. Flat fish fillets will take about 5 minutes; whole fish, or fillets such as sea bass, will take 12-14 minutes. The fish should turn opaque and flake slightly but still remain moist. Remove the plate of cooked fish and pour off any liquid that may have accumulated. 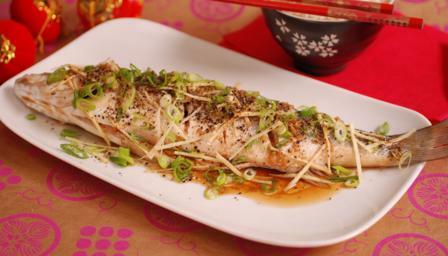 Scatter the spring onions on the fish, then drizzle over the light and dark soy sauces. Heat the two oils together in a small saucepan until smoking, then immediately pour them over the fish. Garnish with coriander and serve at once with boiled rice.